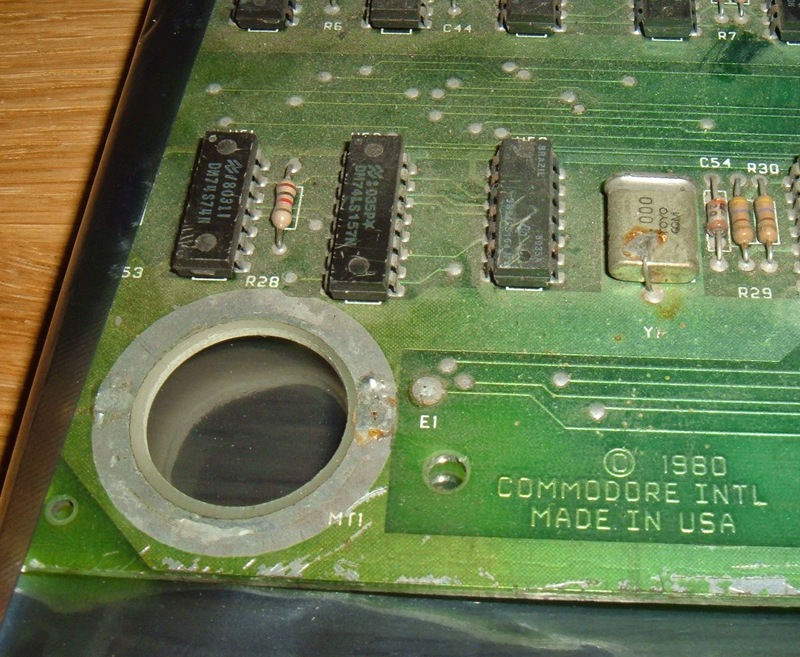 Here is another Commodore CBM 8032 board to be repaired. This one is slightly later than the previous 8032 board I repaired, but earlier than the universal dynamic pet board in the long running 4032 restoration saga. Like the other early board, it is 80 columns only, but jumpered for 16 or 32K. A few other differences from the later boards. There are three voltage regulators, two 7805 and one 7812. 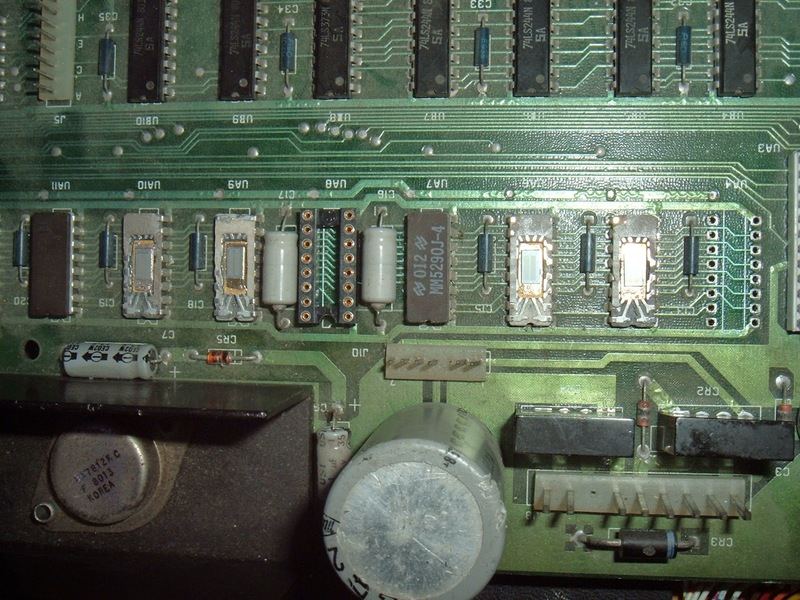 Later they dispensed with the two 7805s (5V @ 1A each) and replaced them with a single LM323K (5V @ 3A). 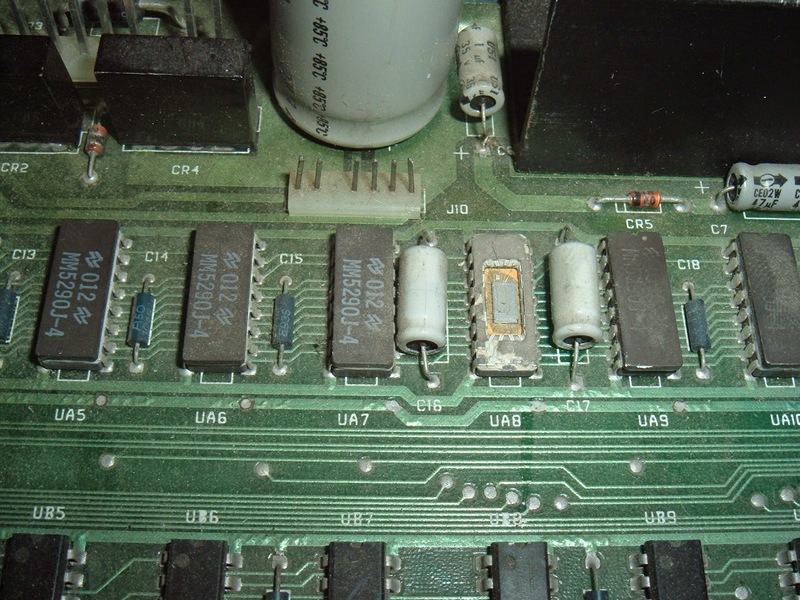 The earlier board had gold plating on all three rear edge connectors, but not the side datasette 2 connector. 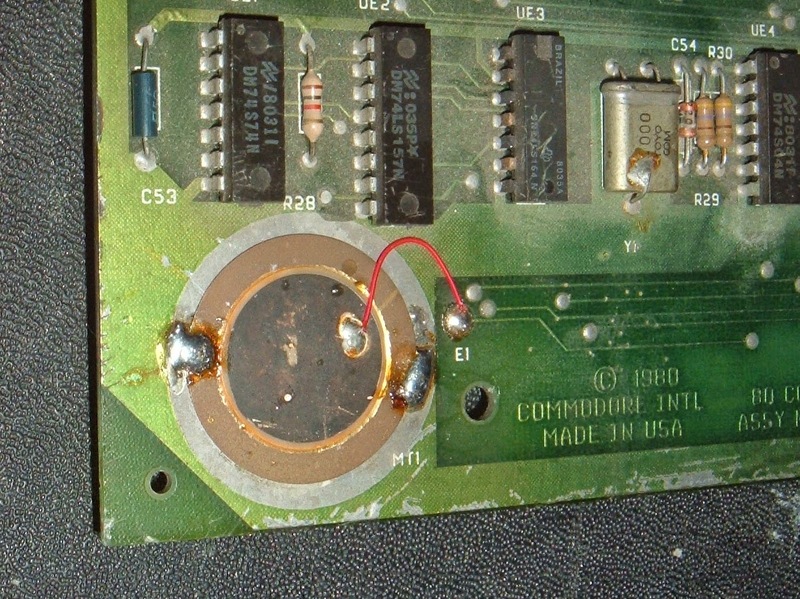 This one like the remainder of the PET boards has gold plated IEE488 / GPIB connector and the rest solder tinned. There is also space for a pin header for the GPIB port. It was populated on the earlier board. Here it isn't, and in later boards it was removed altogether. 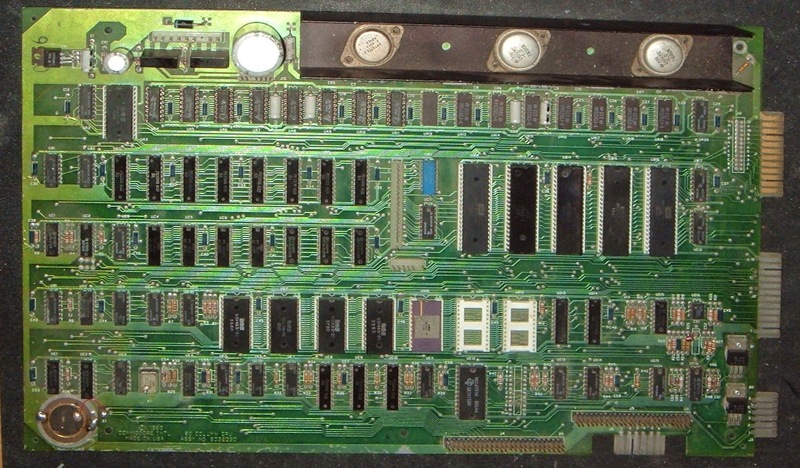 These earlier boards had the cassette transistors riveted down. Later boards they are left floating in the air. 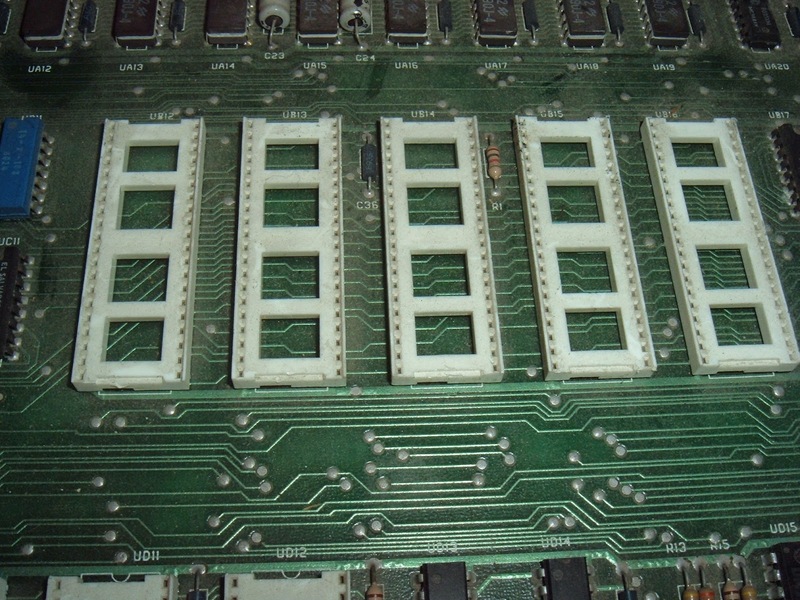 They also tend to have white sockets on the ROMs and the five main chips. Being white it stands out even more that all five 40 pin chips are all missing. The ROMs are present, and there is a ceramic version of the later 901465-23 BASIC 4.0 ROM. 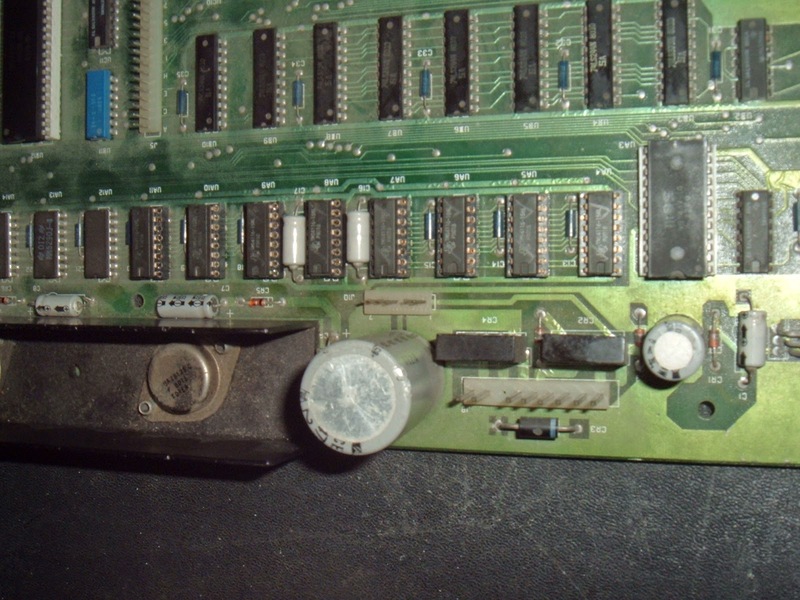 As you will see from the keyboard and video connectors above, it is not in the best of condition, most of the pins are bent. It does however, have the same symptoms. Nothing on the screen. No beep. Obviously one reason it doesn't beep is the piezo disc is missing, but it's probably a lot more than that. The RAM is made up of 16 ceramic MM5290J-4 4116 clones. These had very long legs which were all mangled and shorting on the rear. Forgot to take pictures of those, but I did clip them all short. The lid of one of the chips was rattling around in the bag when it arrived. All of the bits must have all fallen out. 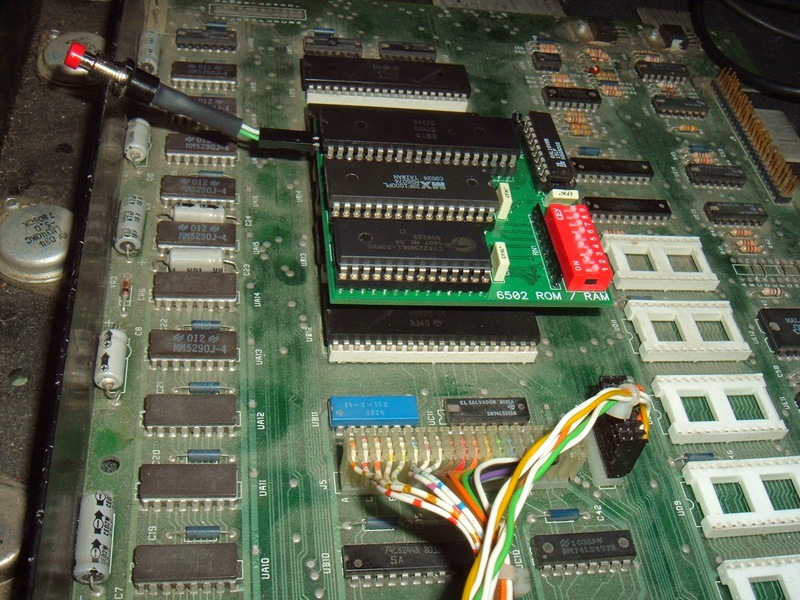 The first job was to tidy up all the pins and replace the piezo and the damaged DRAM chip. 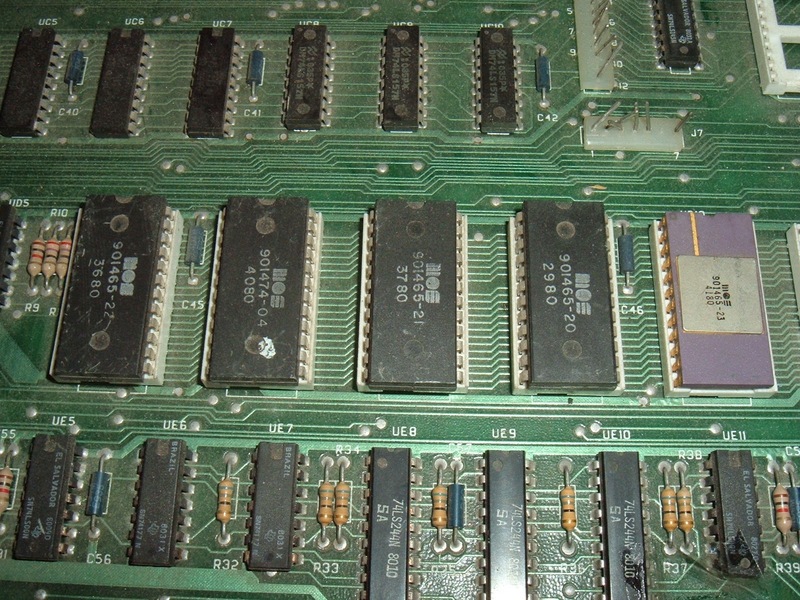 Powering on with all the chips removed passed, so no problems with voltage or shorts on board. .
Next, a working set of 40 pin chips, from left to right, 6520 (GPIB PIA), 6522 (VIA), 6502 (CPU), 6545 (CRTC), 6520 (Keyboard PIA). After testing, the 6520's were replaced with new WDC 65C21N's, and the 6522 with a new 65C22N. Time for the ROM / RAM replacement board. 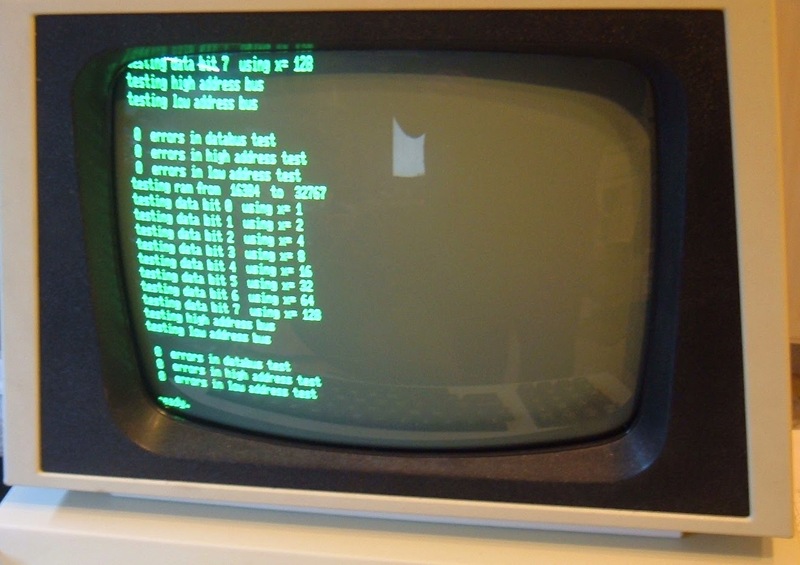 That booted fine, but failed with either onboard ROM or RAM enaabled. 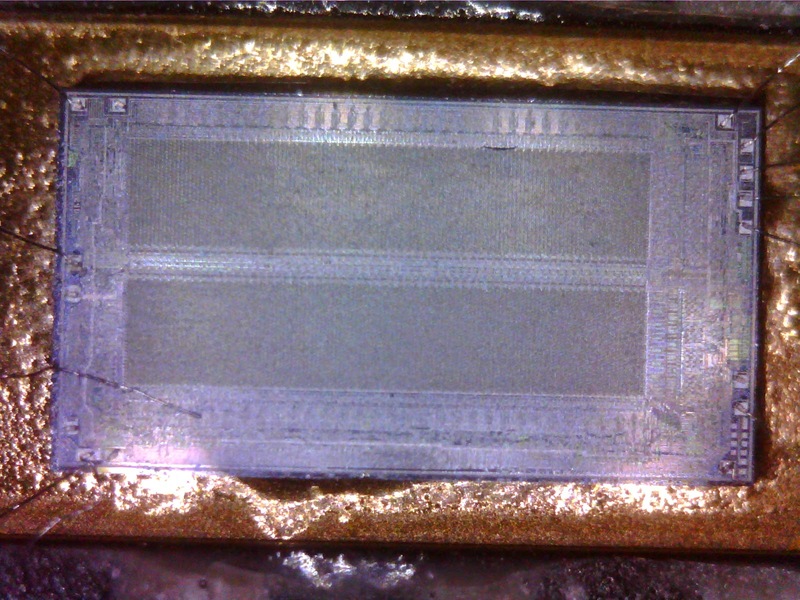 Some of the DRAM chips were getting very hot, particularly the bottom few, so I started to replace those. It was at that point that I found that more of the DRAM chips were falling apart. The lids just peeled off. Eventually all of the lower 8 chips fell apart. The top 8 were seemingly intact. Inside, 16384 bits of DRAM. You can just see a few loose bonding wires in the way. With those replaced, the RAM tests passed. The ROMs were next. I'd found the monitor ROM 091474-04 was also hot and not working. 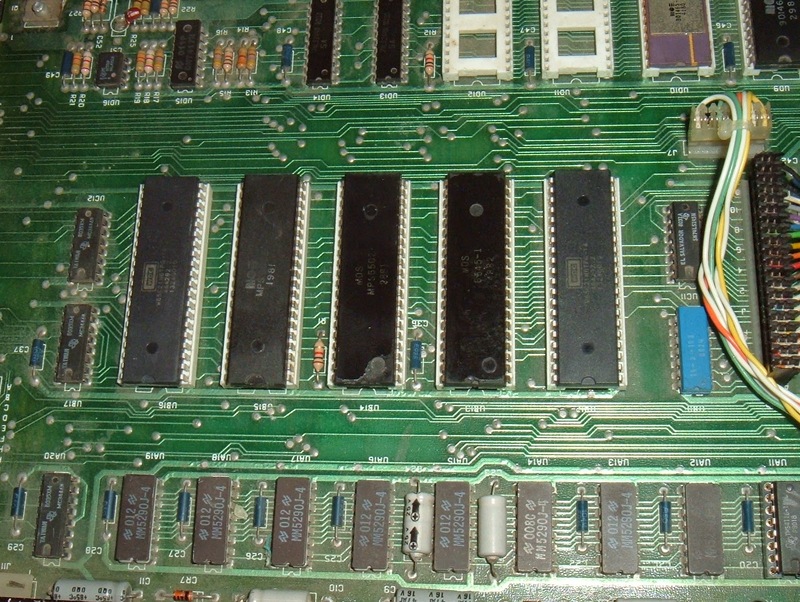 Replacing that, the ROMS were fine, and the ROM/RAM board could be removed. That's complete and has been on soak for a few days with no problems. Another one back in service. I have something lined up for this board in the coming weeks. Update: This board has now found it's new home in an early 8032.